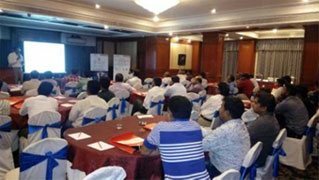 To reach the customers, Bry-Air, Plastic Division has organized three seminar in Bengaluru, Faridabad, and Madhurai in the first quarter 2017. In total, the seminar was 114 officials joined the session which was led by Mr. Chandan Saha, AVP in Bry-Air PDE, along with his team. Bry-Air shared their knowledge and experience on plastics drying, trends & technologies, conveying & blending and heating & cooling..